Welcome to The Birthday Take, a column dedicated to celebrating Oscar nominees and winners' birthdays by paying tribute to the work that got them noticed. This isn't meant to be an exhaustive retrospective, but more of a highlight of one nominated work that makes them noteworthy. The column will run whenever there is a birthday and will hopefully give a dense exploration of the finest performances and techniques applied to film. So please join me as we blow out the candles and dig into the delicious substance. I don't think that it's an insult to suggest that All That Jazz is one of the most self-involved, egotistical films of all time. It's a film that is inconspicuously about Bob Fosse's real life as a theater choreographer through the guise of Roy Scheider's lead character. The final song declaring his death tramples on in a repetitive melody as flamboyant sets rise around him. It's at times dreamlike and develops what is often referred to as "Fosse Time." This specifically references how the film is capable of progressing stories chronologically as well as simultaneously, backwards, and even sideways. At times it becomes difficult to not suggest that this is Fosse stroking his ego and glorifying his death in ways that seem unnecessary. However, there's one thing to consider when writing a film that is clearly about one of theater and musical film's most important resource in its history: it's important to go out with a bang that is overwhelmingly awe-inspiring. After all, theater isn't always perfect - so why should this film be? When looking at his filmography, it could be easy to pick Fosse's more iconic work in Cabaret, which remains one of the greatest World War II musicals in history. His direction even then was ambitious and attempted to mix styles so fluently that it's hard to disapprove of each musical number essentially being a cutaway gag. It all services a bigger, more passionate point. By the time that Liza Minnelli gets to the title song, the film has created its own beautiful logic that it becomes poetic. Fosse was the next level of musical film, and nobody has really captured it as well as him since. Maybe Rob Marshall has shown glances of it in Chicago, but even he has dropped the ball in works like Into the Woods. To say the least, Fosse can be as self-indulgent as he wants because it only brings out the best in him and the art that he creates. You don't have to know who Fosse is to admire All That Jazz. It's a film that shows an artist coming to terms with their legacy in such lively fashion that no faux-biopic could possibly compete. His scenes of popping pills and getting ready to rehearse becomes its own hypnotic routine that suggests something deeper about the character which each use of the phrase "It's showtime." He is putting on a show for his class, and sometimes that includes more frivolous affairs. Fosse was an eccentric, and Scheider's performance is nothing but. By the third act, the Fosse Time is so ingrained that the unexpected reveals are done magnificently and without question. He dances through a flooded room at ease. He sees the world fall apart around him, and yet all he can do is embrace his art and go out singing and dancing. Of course, it's a little bold to think of making a musical biopic about your own death. It's even more candid to be so self-effacing about it. It's hard to imagine what audiences would think of Fosse had All That Jazz not been made. He likely would still have Cabaret and Lenny to his credit. Most would recognize his productions, but not the man who passionately made them work. However, it's because of All That Jazz that the portrait of Fosse has been altered to his desired, flawed image. It's one thing to make this film about an eccentric type. It's another to make him so inherently gifted while being occasionally incompetent. He is one of those characters that shouldn't make as much sense as he does. 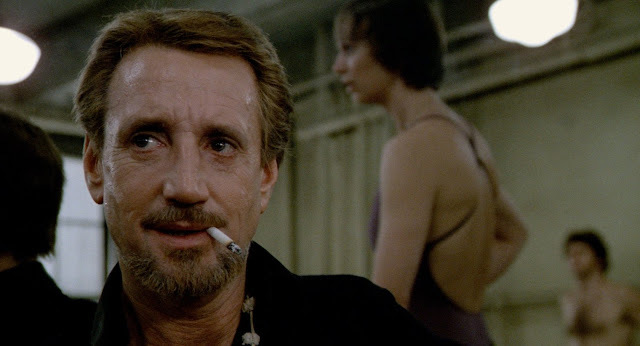 Whether or not Fosse is quite like Scheider's character, it's hard not to separate the two once you see the connections. Instead, it's a loving masterpiece to himself that thankfully took off and became its own iconic hit. The truth is that Fosse is a hard act to follow. While there are great directors for musicals like Stanley Donen or Vincente Minnelli, they tend to lack the authenticity. It could be that the others came from a studio mandated conventionality whereas Fosse almost seemed to have free will. Even then, it's strange that he was able to do half of the things that he did on the budget that he did. One can only hope that there's more artists like Fosse who get a chance to represent themselves so candidly and personally without sacrificing entertainment. There are those that may be that in time, but they're divisive figures right now. Fosse unfortunately passed away in 1987 and couldn't grant the world with more brilliant movies musicals. Still, for a magnum opus, he sure knew how to stroke his own ego.